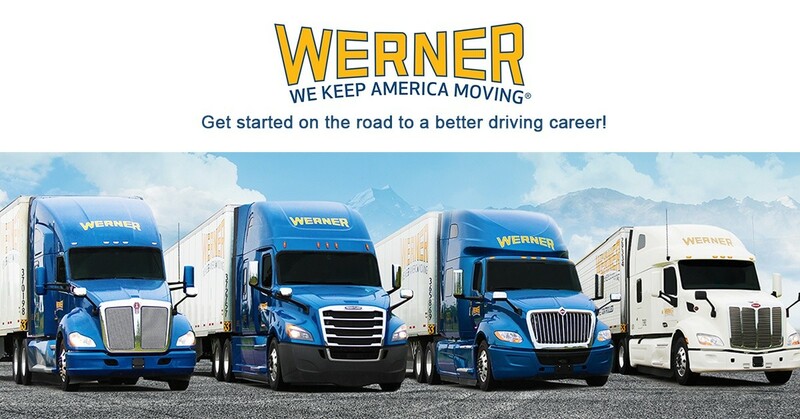 Werner Is Now Hiring Student Drivers In The Council Bluffs, IA Area! Tuition Reimbursement Up To $15,000! After you have been driving with the company for six months as an experienced driver and passed our certified training program, you have the potential to become a trainer and increase your earnings. If you meet the qualifications and are accepted into our Student Driver Program, you must complete the Werner training program (minimum of 275 driving hours). During the training period, the driver trainer and the Training Department staff will evaluate each student. Interested in obtaining a class A CDL and driving for a winning team? Please call Werner Enterprises Student Recruiting Department at 855-888-6439. We will help get you started by referring you to Werner Enterprises approved driving schools in your area. Driver’s Management (DM) will reimburse to the driver, $250 per month, on the first pay period of each month, as long as you are employed with Werner. Reimbursement will start on the first pay period of the month following the completion of 30 days employment. The total amount reimbursed will not exceed $15,000. Driver’s Management (DM) will reimburse to the lending institution, $250 per month, as long as you are employed with Werner. Tuition reimbursement will start on the next pay period following the completion of 30 days employment. The total amount reimbursed will not exceed $15,000. Automatic Payroll Deduction is available if your monthly loan payment exceeds $250 per month. Please contact our Tuition Reimbursement Department at 855-888-6439 ext 2095, for further information. Interested in obtaining a class A CDL and driving for a winning team? Please call Werner Enterprises Student Recruiting Department at 855-888-6439 and we will help get you started.